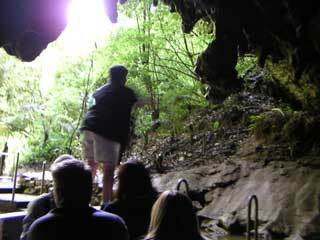 Waitomo is famous for its glowworm caves. Strictly speaking, the 'worms' are not really worms, but some kind of maggot. However, glowworm sounds a lot better than glowmaggot, so who cares ! We were not allowed to make pictures inside the caves (we might upset the glowworms). 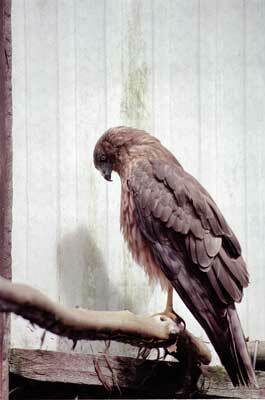 To give you an impression of what you may see in here, we scanned some postcards. 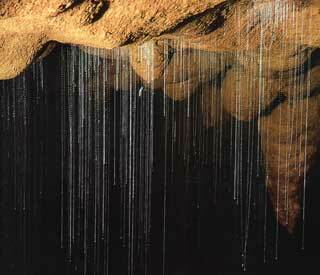 The glowworms itself are great: lots of tiny specks of light at the ceiling of the caves. But the best are the numerous threads hanging from the ceiling. Those are somewhat like the web of spiders: sticky to catch flies who try to reach the exit of the cave by flying towards the light. 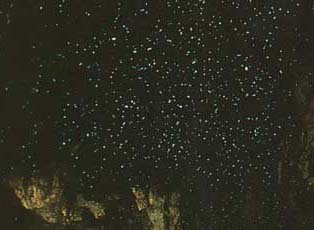 You can choose from several ways to see the glowworms. 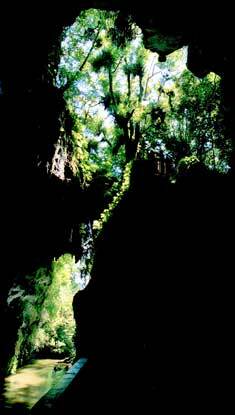 The most spectacular involve crawling through narrow caves, canyoning and rafting in the dark (blackwater rafting). 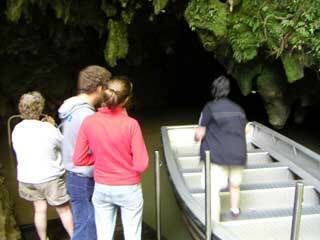 We did the tour for elderly people, in a boat pulled forward by the guide by steel cables hanging in the cave. After all, Leon has turned 40 last year. We went early, to get on the first tour. The guide told us this was the best tour, because the glowworms weren't yet stressed by the visiting crowd of the day. And we think we have a tough life. 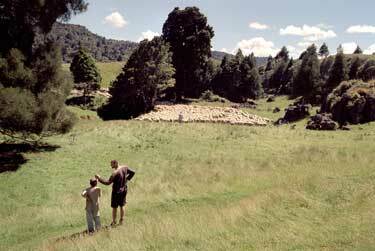 The surroundings here are great. As you drive around, you might see a Hobbit disappear behind a tree. They certainly live in the neighborhood. We were lucky: we saw a real farm show. Not a show at the Agrodome in Rotorua for instance, but a real sheepfarmer who moved his sheep with the help of a lot of his dogs. Because the first sheep was already over the dam, the dogs didn't have much to do: the other sheep followed the first one. 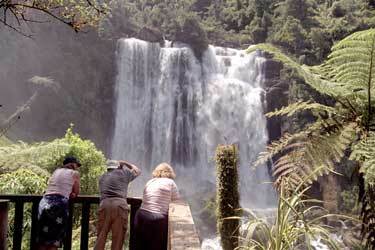 Other things to be seen in the surrounding are the Marokopa falls and a gorge with a natural bridge. 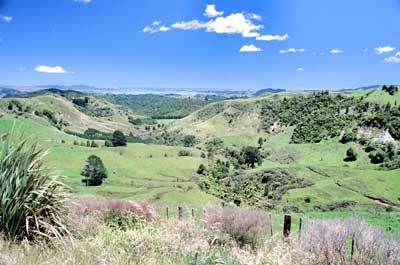 At Otorohanga we visited one of New-Zealands kiwi houses. There are some kiwi's, but as they live in a big and sparsely lit cage (they are nocturnal, after all), you don't get to see much of them. 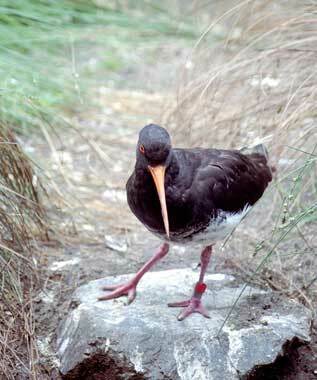 But they also have a lot of other New-Zealand birds. As almost every bird (except for the sparrow and the blackbird) here is different from the birds we have at home, we really enjoyed this. We had already bought a book with the most common birds, so we made a good start.